As a person who regularly submits her writing to literary journals, I'm no stranger to rejection. This is a story about two recent rejections that stood out for very different reasons. Rejection #1: Back in February, I received a rejection for a story I submitted to a journal. I was amused by this rejection, as it was more interesting than the ones I usually get, so I posted a portion of it to Facebook. Now, don't take this the wrong way, but we're going to have to turn your piece away into the cold. Sometimes we've already got a similar piece, sometimes we've seen a few too many like it lately, and sometimes we're just in a bad mood and feel better taking it out on you. A bunch of my friends and relatives (mostly the non-writers - the writers, for the most part, barely batted an eye) responded with comments about how the journal was full of jerks, how I was a great writer and shouldn't give up, how they had heard of other famous writers who had to submit things ten or even twenty times before they were ever published. "Friends," I wanted to say, and did. "I'm not posting this because it's a rejection. I'm posting it because it's so weird and different from the other ten or twenty rejections I receive every week. It's okay. I'm okay. Rejection is just a part of being a writer." And then I headed back to my desk and worked on yet another revision. Rejection #2: Back in September, I had two pieces published in Treehouse magazine. Shortly after, two other online journals contacted me and asked me to submit to their magazines. I had never been solicited by a journal before, and was flattered and excited. I also didn't have anything that suited their publications, so it took me a few months to submit anything. Still, I was pretty certain one of the journals in particular would accept my piece. They were just starting out, they had recently published one of my friend's poems, and they had a chicken for a mascot - clearly, this was meant to be. So when they rejected my piece with a form letter - a form letter! - I took it kind of hard. No more blithe, "This is what it means to be a Writer," statements, while sipping a cup of coffee and shrugging my shoulders. That Chrissy was gone. In her place was a distraught and dejected Chrissy, convinced that she would never be published again, that she was a terrible writer, that success was too far away and too hard to reach. I may have sat on the couch and cried into a glass of wine. I'm not proud of this. So what made rejection two so much harder to handle than rejection one? My guess - and it's a good one, if I do say so myself - is expectation. For the most part, I don't expect to get published every time I submit a story. I expect to get published occasionally, of course - writing isn't completely hopeless, thank god - but I understand that "no" will far outnumber "yes" (at least until Oprah and I become BFFs). In the first rejection, the wording was funny and odd, but not surprising. In the second rejection, the form letter was curt and perfectly professional, and that's why it hurt so much. I expected more because they asked me to submit, but the truth is they didn't owe me anything. So what's the point of all this? Simply: rejection happens. 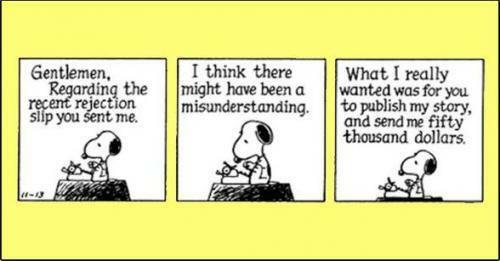 Sometimes it's because the piece you wrote isn't a good fit for the journal. Sometimes it's because an overworked grad student only pretended to read it. Sometimes it's because your writing isn't there yet, and frankly, you need to work harder. Mostly, I think, it's that last one. There are a lot of talented writers in the world, and we're all trying to get into the same publications. The only way to claim your spot is to cry into your glass of wine and then, once you've wiped away the tears, get off the couch and back to work.